Liquid chromatography is the main method for assaying bioactive compounds in biomass. Total phenolic content and antioxidant capacity are measured with spectroscopy. Phenolics are the most important bioactive substances in short rotation coppice. Secondary metabolites of black locust, willow and poplar have many different activities. The richest source of bioactive compounds are flowers, bark and buds. The black locust (Robinia pseudoacacia), willow (Salix spp.) and poplar (Populus spp.) may be the source of the biomass obtained from natural habitats as well as intentionally established plantations in the system of short rotation coppice. These species are promising candidates as an alternative source of bioactive compounds in researches for developing new bioproducts for multidirectional uses, including polymers, lubricants, construction materials, pharmaceuticals, as well as bioenergy and fuels. Various parts of plants, such as leaves, flowers, seeds, bark, woods, buds, catkins, whole tree material and bee products (honey, propolis) are a source of bioactive compounds. The characterization of these compounds, especially phenolic compounds (flavonoids, stilbenes, lignans, phenolic acids, tannins and phenolic glucosides), fatty acids, sterols, etc. may be determined by a variety of analytical (spectroscopy, chromatography) and extraction methods. This review contains 131 references and systematize all available data on the characterization of the bioactive compounds in the biomass of black locust, poplar and willow by analytical and extraction methods. The biomass is one of the most readily available renewable sources used in various branches of food, forestry, construction, energy, pharmaceutical and chemical industries. The fast-growing trees and shrubs include plants belonging to the genera of Salix, Populus, Robinia as well as Eucalyptus (Ceotto et al. 2016; Dillen et al. 2013; Krzyżaniak et al. 2015; Manzone et al. 2015; Stolarski et al. 2015a). Nowadays, fast-growing trees and shrubs are at the center of interest of many research institutions (universities, institutes, etc.) and also companies of the world. This is due to environmental, social and economic benefits of such plants biomass cultivation and use (El Kasmioui and Ceulemans 2012; San Miguel et al. 2015; Stolarski et al. 2017; Van Lantz et al. 2014; Volk et al. 2006). Fast-growing trees and shrubs may be obtained from natural habitats as well as intentionally established plantations. The plants from the plantations may be collected in the framework of the short rotation coppice (SRC) system, also known as the short rotation woody crops (SRWC) or collected in the short rotation forestry (SRF) (Sgori et al. 2015; Stolarski et al. 2015a). These plantations should be established mainly on poor quality marginal soils, variously defined in the literature (too dry, too wet, poor terrain or polluted) (Ghezehei et al. 2015). The main point is that there should be as little competition as possible between plants for food production and those intended for energy, industrial or biorefinery purposes (Stolarski et al. 2015a). Fast-growing tree and shrub biomass may be used in a multidirectional way. Firstly, it can be a raw material to produce solid, liquid and gaseous biofuels. Secondly, it may be used for the production of heat, electricity or cold and also renewable bioproducts, including biochemicals (García et al. 2014; Krzyżaniak et al. 2014; Parajuli et al. 2015a, b; Stolarski et al. 2013, 2015b). However, due to a large generic and species diversity of fast-growing trees and shrubs, their suitability for energy, industrial or integrated biorefineries may be different. For instance, in the multi-criteria assessment of different types of biomass as a substrate for biorefinery, it was found that willow biomass was more valuable in a comparison with the biomass of poplar and miscanthus (Parajuli et al. 2015a). It should be emphasized that each type of biomass, including those obtained from fast-growing trees and shrubs, should be used in a sustainable and cascading way. This means that such biomass should not be used only for energy purposes without considering the option of its use for products with higher added value. In addition, fast-growing tree and shrub biomass is used to produce a wide range of bioproducts, including polymers, lubricants, construction materials, pharmaceuticals, as well as bioenergy and fuels. However, to enable wide and valuable use of fast-growing tree and shrub biomass, it is necessary to perform qualitative and quantitative analysis of bioactive compounds present in the biomass. In connection with the above, the aim of our work was to systematize all available data on the characterization of the bioactive compounds in the biomass of black locust, poplar and willow by analytical and extraction methods. Bioactive compounds from plants are classified according to different criteria including functional, pharmacological or toxicological effects. However, Bernhoft (2010) classified phenolic compounds according to biochemical pathways and chemical classes. The main groups of bioactive compounds include: (1) phenolic compounds, (2) glucosides, (3) terpenoids, (4) resins, (5) carotenoids, (6) tocopherols and tocotrienols, (7) phytosterols, (8) alkaloids, (9) furocoumarins and naphthodianthrones, (10) proteins and peptides, (11) l-ascorbic acid and others (Barba et al. 2014; Bernhoft 2010; Blomhoff 2010). Tree and shrub biomass, including short rotation woody crops, contains secondary metabolites with a proven biological activity (Mahdi 2010; Peng et al. 2017; Sulima et al. 2017; Valette et al. 2017). The phenolic compounds are one of the most important and most commonly occurring groups of bioactive substances in woody plant tissues. Phenols are important in plant physiology with their role in pigmentation, flavor and resistance to pathogens and pests (Cheynier et al. 2013; Heiska et al. 2007). Most phenols have antioxidant properties due to hydrogen-donating properties of the phenolic hydroxyl group and are the most abundant antioxidants in a human diet (Blomhoff 2010). 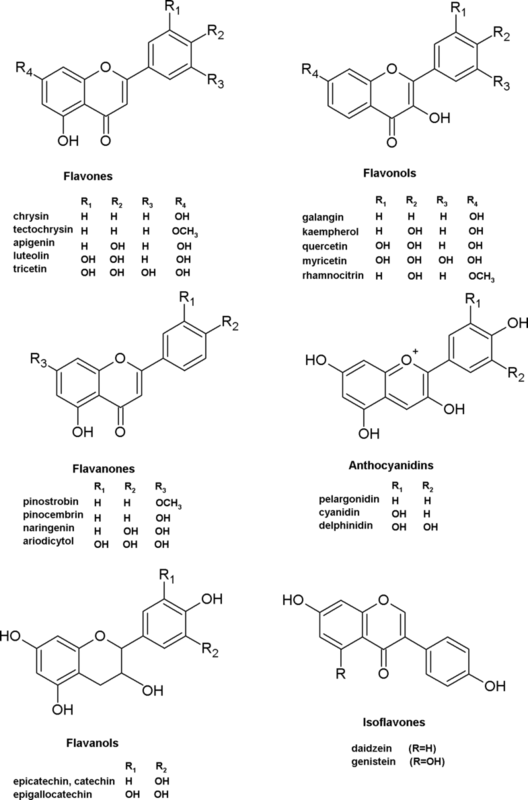 The five main classes of bioactive phenolic compounds are phenolic acids, flavonoids, stilbenes, lignans and tannins (Blomhoff 2010; Falcone Ferreyra et al. 2012). So far, over 8000 thousand flavonoids have been identified. The group of flavonoids is divided into six sub-groups, such as flavones, flavonols, flavanols, flavanones, isoflavones and anthocyanins (Blomhoff 2010; Koirala et al. 2016; Zhang et al. 2015a). The raw materials obtained from black locust, especially from flowers obtained during the growing season are a promising source of flavonoids (Călina et al. 2013; Kicel et al. 2015; Sarikurkcu et al. 2015; Song et al. 1992; Veitch et al. 2010). In the whole black locust biomass collected in the summer, a number of flavonoids were detected, including acacetin, secundiflorol I, mucronulatol, isomucronulatol and isovestitol (Tian and McLaughlin 2000). A good source of flavonoids but also extremely valuable stilbenes (piceatannol and resveratrol) may also be the black locust wood. This raw material can become an economical and sustainable source of bioactive phenolic compounds (Sergent et al. 2014). The whole plant collection can be mechanized and profitable (Stolarski et al. 2017) and it is certainly less labor and cost-intensive than manual flower or leaf collection. Flavonoids were also detected in willow leaves (Paunonen et al. 2009), poplar leaves and buds (Dimkić et al. 2016; Isidorov and Vinogorova 2003; Kuś et al. 2018; Rivera et al. 1997; Rubiolo et al. 2013), and also in willow bark (Heiska et al. 2007; Jürgenliemk et al. 2007; Paunonen et al. 2009; Pobłocka-Olech 2006) and poplar cortex (Zhang et al. 2006). 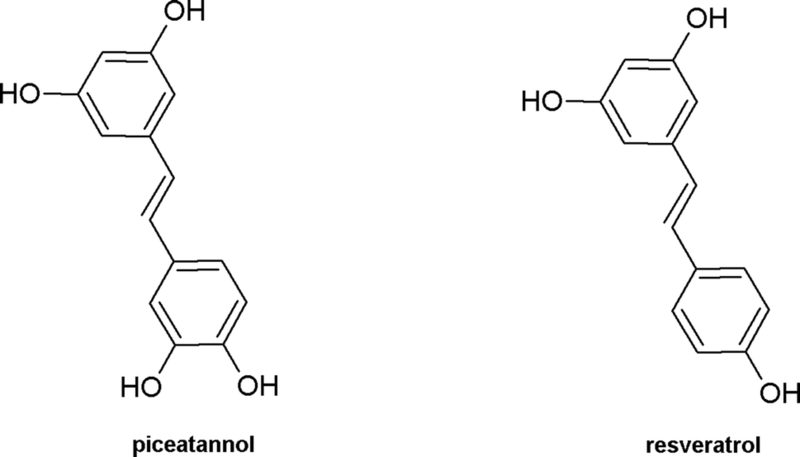 Stem wood of willow contains flavonoids as well as lignans, which are non-flavonoid polyphenols with potential antidiabetic and anticarcinogenic effects (Brereton et al. 2017) (Figs. 1, 2). Some of the phenolic acids and flavonoids are also characterized by antimicrobial activity (Joshi et al. 2015; Rauha et al. 2000). Phenolic glucosides, also known as salicylic compounds, have different pharmacological effects (Fig. 3). These compounds are found mainly in trees and shrubs, including short rotation crops from the Salicaceae family (willow, poplar). Phenolic glucosides are also detected in plants from other families, such as medlar (Mespilus germanica L.), Voodoo lily (Sauromatum guttatum Schott) and gumweed (Grindelia spp.) (Gruz et al. 2011; Khadem and Marles 2010). The most known compound among salicylic compounds is salicin (salicyl alcohol glucoside), which was discovered in the nineteenth century. Moreover, salicylic acid has a protective function in the plants which synthesize this secondary metabolite as a phytohormone involved in the plant resistance responses to environmental stress and pathogen attacks (Babst et al. 2010; Holmboe-Ottesen 2010; Shah 2003). Tannins are very widely distributed in the plant kingdom. There are two types of these bioactive compounds known, such as condensed and hydrolyzable tannins. The first group consists of large flavonoid polymers which are characterized by the binding properties to microbial proteins. This property is responsible for the antibacterial activity of tannins (Bernhoft 2010; Nagesh et al. 2012), which protect the plant against fungi and insects. These compounds are detected in all parts of plants, but the most are found in wood, bark, fruits and galls (Altemimi et al. 2017; Shrestha et al. 2014; Zhang et al. 2015a). Like the other phenolic compounds, tannins have antioxidant effects but they also show antimicrobial, antiprotozoal, anti-inflammatory, antidiabetic, anticarcinogenic, hepatoprotective, cardioprotective and antiallergic properties (Macáková et al. 2014). Condensed tannins were detected in poplar leaves (Li et al. 2011; Rubert-Nason et al. 2013), black locust wood (Fan et al. 2010), willow wood (Brereton et al. 2017) willow cortex (Heiska et al. 2007; Juntheikki and Julkunen-Tiitto 2000) and in poplar bark (Li et al. 2011). Black locust (Robinia pseudoacacia) is a rich source of antioxidants. Flowers contain the highest number of flavonoids in the range of 0.15 mg/mL to 0.9 mg/mL (Kicel et al. 2015). In the studies conducted by Călina et al. (2013), the focus was put to determine two flavonoids, such as rutin (ruthoside) and hyperoside in methanolic extracts from flowers, leaves, bark and seeds. Flavonoids were analyzed by thin-layer chromatography (TLC) coupled with photo-densitometry. The quantities of the determined substances differed in the extracts. The flower extract contained more hyperoside (0.9 mg/mL) than the leaf extract (0.17 mg/mL). On the other hand, in the case of rutin, the leaves contained almost six times more rutin than the flowers (0.98 mg/mL vs 0.17 mg/mL). There were no significant amounts of both flavonoids found in the seeds and bark of black locust (Călina et al. 2013). The TLC method for the separation of black locust flavonoids was also used by Tian and McLaughlin (2000). The structures of acacetin, secundiflorol, mucronulatol, isomucronulatol and isovestitol were confirmed by NMR analysis. However, the quantitative analysis of the compounds was not performed. In the case of studies by Veitch et al. (2010), the focus was put on the separation of robinin (kaempferol-3-O-ramnozil-galactosil-7-ramnozide), acacetin-7-O-rutinoside, apigenin, diosmetin and luteolin from black locust leaves and flowers with the use of high-performance liquid chromatography equipped with UV detection (HPLC-UV) and tandem mass spectrometry (HPLC-MS/MS). Sergent et al. 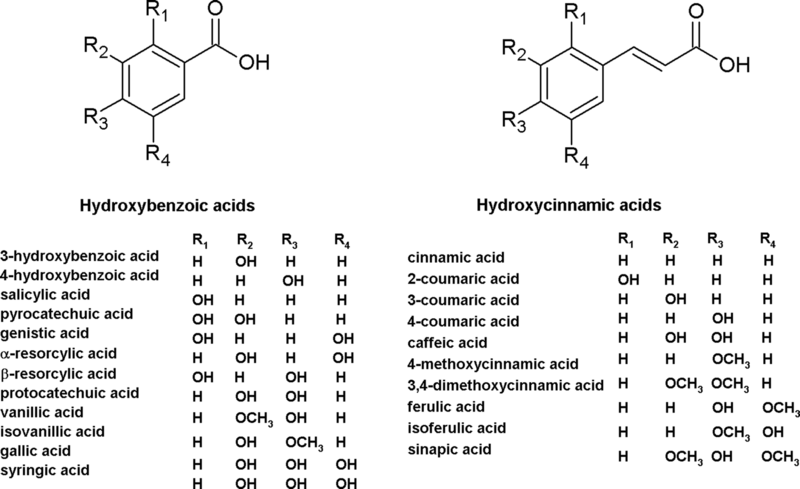 (2014) determined phenolic compounds in the wood of R. pseudoacacia. The total content of phenolic compounds in the wood from black locust was 22.47–28.59 g/kg. Among flavonoids, (+)-dihydrorobinetin (17.25–21.36 g/kg wood) and robinetin (3.60–4.68 g/kg wood) were identified with the highest content. Such stilbenes as piceatannol and resveratrol were identified in the wood of the black locust for the first time (Fig. 4). Piceatannol occurred in a juvenile and mature wood with an amount of 0.26 and 0.65 g/kg wood, respectively, whereas resveratrol was in a lower amount of 0.017–0.271 g/kg wood. Stilbenes are very valuable bioactive compounds of increasing nutraceutical, cosmetic and pharmacological importance. 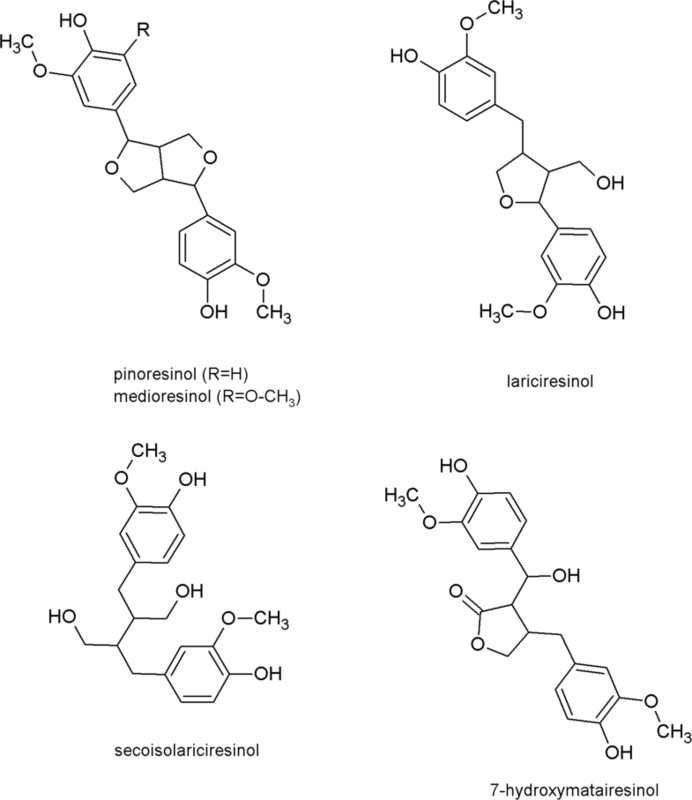 Moreover, black locust wood can be an economical and sustainable source of piceatannol and resveratrol (Sergent et al. 2014). The studies on flower and leaf extracts obtained by hydrodistillation were carried out by Kicel et al. (2015) with the use of gas chromatography equipped with both mass spectrometry and flame ionization detector (GC–FID–MS). One-third of the composition of the flower extract was monoterpenes including linalol (20.4%), geraniol (2.0%), terpinen-4-ol (1.7%) and α-terpineol (1.5%). Another group of the compounds present in the extract were sesquiterpene alcohols (13.1%) and hydrocarbons (20.2%). In the first group, the main compounds were forms of cis- and trans-farnesol, nerolidol and β-bisabolol. In the case of the leaf extract, the main constituents were aliphatic alcohols up to ca. 65%. The amount of sesquiterpenes, monoterpenes and diterpenes was 7.7%, 0.6% and 9.1%, respectively. In a comparison to the flower extract, the content of linalool in the leaf extract was much lower and amounted to 3.5%. The differences in the content were also observed for 1-octene-3-ol, which amounted to 13.4% for flower extract and 57.9% for leaf extract, but also 3-methyltetradecane (respectively, 16.5% and 0.4%) and 6,10,14-pentadecanone (hexahydrofarnesyl acetone) (respectively, 14.9% and 1.2%) (Kicel et al. 2015). Mészáros et al. (2007) employed pyrolysis–gas chromatography/mass spectrometry (Py-GC/MS) and thermogravimetry/mass spectrometry (TG/MS) to analyze compounds in extracts obtained by the Soxhlet extraction with different solvents and extraction times. Another method used for the analysis was thermally assisted hydrolysis and methylation–gas chromatography/mass spectrometry (THM–GC/MS). In the extract, such compounds as methyl esters of fatty acids, aromatic compounds (syringol, eugenol, guaiacol) and sterols (β-sitosterol) were identified. The pyrolysis chromatography showed the presence of saturated hydrocarbons (nonacosane, docosane, pentacosane) and unsaturated hydrocarbons (docosene, tetracosene, hexacosene), but also sterols (stigmasterol, kaempesterol, β-sitosterol) and aromatic compounds. The composition of extracts in dichloromethane, acetone and ethanol was compared. For instance, the content of phenolic compounds was much lower in dichloromethane extracts than in those obtained with ethanol and acetone. Black locust seeds were sown under specified conditions and then the root exudates were analyzed in terms of phenolic compounds by high-performance thin-layer chromatography with silica gel (HPTLC), HPLC and GC–MS by Scheidemann and Wetzel (1997). The compounds identified qualitatively in the root exudates included 4′,7-dihydroxyflavone, apigenin, naringenin, isoliquiritigenin and chrysoeriol (Scheidemann and Wetzel 1997). In other studies, HPLC method was used for the separation of gallic acid, (+)-catechin, (−)-epicatechin, syringic acid, vanillic acid, p-coumaric acid, resveratrol, rutin and quercetin. In the ethanolic extract from leaves, catechin (0.925 µg/mL), rutin (0.831 µg/mL), resveratrol (0.664 µg/mL) and quercetin (0.456 µg/mL) were identified, whereas in the seed extract the amount of catechin, epicatechin and rutin was 0.127 µg/mL, 0.239 µg/mL and 0.231 µg/mL, respectively (Marinas et al. 2014). The identification of bioactive compounds by NMR method was performed by Hong et al. (2017). For the first time the authors isolated such phenolic compounds as norathyriol, catechin lactone A, urolithin C, urolithin M6 and bis(2-ethylhexyl) phthalate from R. pseudoacacia dried and milled bark. Catechin lactone A was isolated for the second time from natural products (Hong et al. 2017). An important dietary and natural products from black locust are bee products (honey, propolis, bee pollen, bee wax and royal jelly). Most of the bioactive compounds contained in honey and other bee products come from tissues and plant liquid secretions (Ares et al. 2018; Osés et al. 2016). Honey from R. pseudoacacia is pale and clear, containing lower concentrations of antioxidants compared to other dark honey, such as honey from buckwheat (Fagopyrum esculentum Moench) and heather (Calluna vulgaris (L.) Hull) (Kuś et al. 2014). Kuś et al. (2014) determined total phenol content, antioxidant activity and color characteristics in six unifloral honey types, as well as general HPLC fingerprints. In addition to GC, HPLC and UPLC methods, affinity chromatography (AC) was also used, which is a type of liquid chromatography based on the use of specific chemical reactions between chemically reactive ligands bond to the stationary phase and atypical components of the mobile phase. It is generally used to separate proteins, e.g., lectins (Gonçalves et al. 2017; Hage et al. 2017; Perret and Boschetti 2018). The lectins were isolated, among others from R. pseudoacacia seeds with the use of AC with ovomucin and elution with different buffers (Fleischmann and Rudiger 1986). In the past, high interest was put on lectins in plant seeds of Leguminoseae family (Papilionaceae, Caesalpinoideae, Euphorbeaceae, Solanaceae, Graminaceae) (Etzler 1985; Tazaki and Yoshida 1992). The physiological role of lectins present in R. pseudoacacia is protein storage (Nsimba-Lubaki and Peumanns 1986). The black locust is referred to as a unique tree because lectins are present not only in seeds, but also in other parts of the tree, such as tubing and wood, roots, leaves and corms in small quantities (Gietl et al. 1979; Kauss and Ziegler 1974). Various parts of black locust differ in terms of lectin activity and specificity in seasonal changes (Gietl and Ziegler 1980) (Table 1). According to Klessing (2016), the willow bark has a similar medical effect to the one caused by acetylsalicylic acid. However, it does not cause adverse side effects (Chrubasik et al. 2001). Moreover, willow extracts and products treat cold, influenza and angina and are used for rheumatism, muscular neuralgia and headaches, including migraine (Bonaterra et al. 2010; Mahdi 2010). The raw materials obtained from several species of willow are of a pharmaceutical importance and have been used for centuries in folk and modern medicine as a primarily antipyretic agent. These species include Salix purpurea, S. fragilis and S. daphnoides. Other species, such as S. acutifolia Willd are known by their high pharmaceutical properties (Noleto-Dias et al. 2018). The important healing properties of willow is due to the fact that it contains phenolic glucosides (synonyms: salicylic compounds, salicylic glucosides), which are characterized by antipyretic, anti-inflammatory, analgesic and anti-rheumatic effects in humans (Bonaterra et al. 2010; Kim et al. 2015). Moreover, the biomass of different willow species may be a source of other bioactive compounds, especially lignans, flavonoids and tannins. They have various biological activities, especially antioxidant, anticancer and antibacterial (Brereton et al. 2017; Dimkić et al. 2016; Hage and Morlock 2017; Koirala et al. 2016). The species, clones and varieties cultivated in short rotation coppice are characterized by a great potential in this respect. The biomass thus obtained is not always the richest in bioactive compounds; however, due to the high stem wood yield, large yields of salicylates, flavonoids, lignans and tannins can also be obtained. Therefore, such biomass can be important as a biorefinery raw material (Brereton et al. 2017; Paunonen et al. 2009). The willow leaves were already used as an antipyretic drug 4000 years BC by Assyrians. In 1828, salicin was isolated from the willow bark for the first time and 10 years later it was hydrolyzed to G-glucose and salicylic alcohol. On this basis, the structure of salicin was defined as salicylic alcohol glucoside. In the same year, the oxidation of salicylic alcohol to salicylic acids was also carried out (Mahdi 2010). The origin of studies on purple willow includes the isolation of salipuroside (naringenin-5-glucoside) and its isomer from willow bark (Charaux and Rabate 1931, 1933). The willow leaves contain a variety of flavonoids, the highest content of which was observed in a form of luteolin-7-glucoside and naringenin-7-glucoside, and also eriodictyol-7-glucoside in small amounts (Jarrett and Williams 1967). The purple willow leaves have also a very high content of phenolic compounds, especially leucoanthocyanidins, which were transformed into anthocyanidins and examined by paper chromatography. 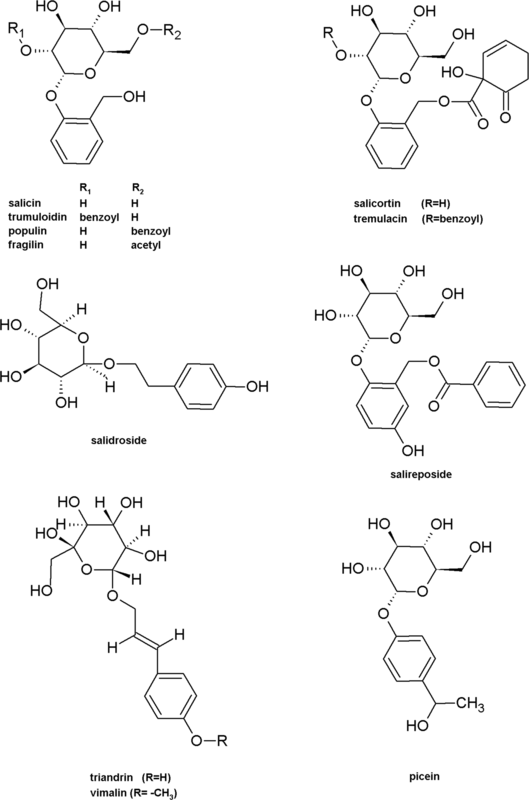 Among salicylates, salicin, salicortin, tremulacin, populin, fragilin and grandidentatin were identified in different species of willow leaves (Binns et al. 1968). The structures of the salicylic compounds are presented in Fig. 3. In the 1980s, GC–FID was used to separate the mixture of glucoside compounds, including salicin, fragilin, picein, salidroside, vimalin, triandrin, tremuloidin, populin and salicortin. Attention was also directed to the influence of the extraction time on the total polyphenol content of the leaf extract (Julkunen-Titto 1985). On the other hand, Pearl and Darling (1971) focused their attention on the structure of salicortin, the ester of salicin and tremulacin, which is 2-O-benzoyl ester of salicortin. The studies were conducted by hydrogenolysis, acid and alkaline hydrolysis as well as infrared spectroscopy (IR) and NMR. In further studies, a glucoside—purpurine was isolated from the fresh bark of the purple willow. The analysis with the use of mass spectrometry and also alkaline and enzymatic hydrolysis confirmed that the structure of purpurine indicated it as the ester of the p-coumaric acid grandidentatum diastereoisomer (Jürgenliemk et al. 2007). The purple willow was also analyzed in terms of anthocyanins. The main compound was cyanidin-3-glucoside, whereas myrtillin (delphinidin-3-glucoside) was identified in trace amount (Bridle et al. 1973). The separation of the mixture of salicylic compounds, such as salicin, picein, salidroside, populin and tremulacin, was conducted with the use of HPLC method in different studies by Pobłocka-Olech (2006), Kenstavičienė et al. (2009), Schmid et al. (2001) and others. The amount of salicin in S. purpurea bark extract ranged from 1 mg/g to 25 mg/g, depending on the clone, while in the bark extract of S. viminalis it was not detected (Pobłocka-Olech 2006). To determine the percentage of salicin in different species of Salix depending on the age of the species and its harvesting period, HPLC–UV method was used by Kenstavičienė et al. (2009). The mobile phase differed from that used by Pobłocka-Olech (2006). Instead of acetonitrile, tetrahydrofuran was used with water acidified with 0.5% phosphoric acid. In the case of 1-year bark of S. purpurea harvested in autumn, the content of salicin was 7.16%, while in the 2-year-old willow extract, the content was 7.77% and 6.36%, respectively, for willow harvested in autumn and spring. The content of salicin derivatives ranged from 2.5 to 10% for S. purpurea. The highest content of salicin in S. viminalis was analyzed in the extract of 2-year-old willow (0.42%) (Kenstavičienė et al. 2009). In the analysis of salicin by HPLC–DAD, the content of salicin in the bark of S. purpurea was 17.6% (Schmid et al. 2001), which was higher than in S. purpurea examined by Kenstavičienė et al. (2009). In the case of S. viminalis, the presence of triandrin and salicin in the ethanolic-water extract was identified by the HPLC method (Minakhmetov et al. 2002). Heiska et al. (2007) and Paunonen et al. (2009) also used HPLC–DAD method in the determination of salicylic glucosides (salicin, salicortin, 6-hydroxy-2-cyclohexenone-salicortin (HCH-salicortin), disalicortin, tremulacin and HCH-tremulacin). The extraction of bioactive compounds was performed by homogenization of dark-leaved willow (S. myrsinifolia Salisb.) bark and leaves with cold methanol. The extract was filtered (Heiska et al. 2007) or centrifuged (Paunonen et al. 2009) and then vaporized to dryness in a vacuum. On the basis of performed analyses, it was found that the content of salicin in bark was 0.00–8.99 mg/g d.m. (mean 1.74) and salicortin 0.40–44.20 mg/g d.m. (Heiska et al. 2007). In the case of leaves, salicin was identified with the amount of 1.8–4.7 and salicortin 44–129 mg/g d.m. The sum of salicylates was about 50–160 mg/g d.m. (Paunonen et al. 2009). Salicin and its derivatives and other phenolic glucosides are characterized by poor absorption of UV radiation. For this reason, Young (2004) applied evaporative light scattering detection (ELSD) in the analysis of white willow extracts, which resulted in salicin signal gaining on ELSD detector compared to UV–VIS detection. Pobłocka-Olech et al. (2007) used ELSD in the analysis of bark extracts from five species of willow. In the analyses of salicin and other phenolic glucosides, the HPLC method provided satisfactory separation of six compounds, such as salicin, picein, salidroside, populin, 2-acetysalicortin and tremulacin. The use of ELSD enhanced the signal of populin and tremulacin. On the basis of studies performed by Pobłocka-Olech et al. (2007), it was found that the content of phenolic glucoside in bark depends on the species and clones of Salix. Total salicin content in bark of S. daphnoides (clone 1095), S. alba (clone 1100), S. purpurea and S. herbacea was 96.43, 36.48, 25.87 and 16.79 mg/g d.m., respectively. The content of free salicin was 1.5–6.3 times lower than total salicin. The bark of S. viminalis was characterized by the poorest salicylate profile. Triandrin was identified as the only compound in the analysis of nine phenolic glucosides. Likewise, Kammerer et al. (2005) analyzed Salix bark extracts. The presence of 13 compounds, including salicylic alcohol, salicylic acid, salicin, isosalicin, picein, salidroside, triandrin, vimalin, tremuloidin, salireposide, salicylic acid and salicin ester, salicortin, isosalireposide, naringein-5-glucoside, naringenin-7-glucoside and tremulacin, was identified by HPLC–MS/MS with electrospray ionization. However, the quantitative analysis was not performed. The chemical composition and content of salicylic glucosides in the bark of different S. purpurea genotypes were also investigated for their use, especially in the pharmaceutical industry. The methanolic extract analysis was performed by liquid chromatography with a diode array detector and electrospray ionisation mass spectrometry (HPLC–DAD–ESI-MS). All tested genotypes contained, with the following elution order, salicin, catechin, salicortin, naringenin-5-O-glucoside, naringenin-7-O-glucoside, isosalipuroside, naringenin and tremulacin. The content of salicylic compounds ranged from 30.4 to 109.6 mg/g, whereas the content of salicin differed depending on the genotype and ranged from 5.0 to 16.5 mg/g. The salicin in S. purpurea genotypes was analyzed and the amount was 5.37–7.45 wt%, which was five times lower in comparison to studies conducted. In the case of salicortin, the amount ranged from 23.0 to 93.0 mg/g. In addition, the presence of picein and populin was confirmed as 100.0 mg/g of the analyzed genotypes (Sulima et al. 2017). In addition to MS, NMR is also used to idenfity bioactive compounds. This technique is particularly useful in the structure determination of new compounds not yet detected in particular plant species. Noleto-Dias et al. (2018) analyzed 86 Salix species in terms of phenolic glucosides content using UHPLC–MS system. The use of NMR spectrometer enabled the discovery of a new natural salicinoid—salicin-7-sulfate. The content of salicin ranged from 2.85 (in the shoots of S. maccaliana) to 57.6 mg/g d.m. (S. acutifolia Willd.). The willow species used in medicine (S. purpurea, S. fragilis and S. daphnoides) did not contain the highest amounts of salicin. Their shoots contained salicin in the following quantities: 29.25, 19.06, 8.40 mg/g d.m., respectively, for S. purpurea, S. fragilis and S. daphnoides. On the other hand, fast-growing species in SRC (e.g., S. viminalis) contained salicin with the amount of 5.01–24.70 mg/g d.m. Salicin-7-sulfate occurred in a number of willow species (including S. purpurea, S. viminalis, S. daphnoides) only in trace levels. The highest amounts were observed in S. pellita and S. koriyanagi; however, no significant correlations were found between the content of salicin and its sulfated form (Noleto-Dias et al. 2018). The identification of phenolic glucosides in S. glandulosa by NMR method was performed by Kim et al. (2015). The salicin derivatives were isolated and their anti-inflammatory, neuroprotective and anticancer properties were evaluated on glioma cells. It was found that 11 of 16 of the isolated compounds had a strong anti-neuroinflammatory effect. Zaugg et al. (1997) introduced another, after HPLC and TLC, method for the determination of salicin in the willow bark by capillary electrophoresis (CE), which resulted in the analysis of salicin in different species of Salix with the content from 3.1 to 13.9 mg/g. CE is a fast method to evaluate the content of bioactive components in plant matrices, but less accurate than the HPLC method (Zaugg et al. 1997). Nevertheless, it is a reproducible method and provides a good separation of antioxidant phenolic compounds, including glucoside derivatives. A new trend is to miniaturize the CE technology as was indicated by Hurtado-Fernández et al. (2010). The purpose of the nanotechnology is to implement miniature analytical systems, such as lab-on-a-chip, which can be used for fast and simple analyses of bioactive compounds, also outside the analytical laboratory. Willow bark is a well-known and valuable source of salicin and phenolic glucosides. However, in addition to salicylic compounds, willow biomass contains a number of valuable non-salicylic phenolic compounds, such as flavonoids, lignans and tannins. These compounds are most often determined by separation techniques, especially liquid chromatography (Brereton et al. 2017). The applications of analytical methods in the separation of bioactive compounds in willow extracts are presented in Table 2. Phenolic acids, such as α-resorcylic acid, caffeic acid, m-hydroxybenzoic acid, p-coumaric acid, p-hydroxybenzoic acid, syringic acid, ferulic acid, vanillic acid, veratric acid, cinnamic acid as well as 4-methoxycinnamic acid in willow bark extracts, were separated by a multiple gradient development high-performance thin-layer chromatography (MGD-HPTLC) by Pobłocka-Olech (2006). MGD-HPTLC technique was also employed in the separation of flavan-3-ols. Both Salix viminalis and S. purpurea were found to contain the following compounds: p-hydroxybenzoic acid, chlorogenic acid, salicylic acid, vanillic acid, ferulic acid, cinnamic acid, protocatechuic acid, p-coumaric acid, quercetin, naringenin, luteolin-7-O-glucoside, naringenin-7-O-glucoside, naringenin-5-O-glucoside and isosalipuroside. In S. purpurea bark, apigenin, kaempferol, caffeic acid, gentisic acid, α-resorcylic acid and quercetin-3-O-glucoside were also identified, whereas dihydroxycaffeic acid, luteolin, myricetin, kaempferol-3-O-glucoside and rutin were analyzed in S. viminalis bark extract. The high content of pyrocatechin was found in the ether extract of acidic hydrolisate of methanolic extract of S. purpurea and trace amounts in S. viminalis. The contents of catechin were compared in bark extracts of S. purpurea (1.57 mg/g) and S. viminalis (5.40 mg/g) by solid phase extraction, thin-layer chromatography (SPE-HPTLC) and liquid chromatography (SPE-HPLC). The results obtained by the last two methods were similar (Pobłocka-Olech 2006). In further studies, quantitative analyses of pyrocatechin were carried out on S. purpurea growing naturally and S. purpurea provided by Labofarm Company. In the latter, the amount of pyrocatechin was 20 times higher than in the extract of ‘natural’ willow (0.09 mg/g). The analysis was performed by thin-layer chromatography with the use of diol-coated silica gel plates (Pobłocka-Olech et al. 2010) (Table 2). The extraction of dried and powered bark of different species of Salix was performed. The quantitative analyses were performed on 10 × 10 cm silica plates by HPTLC. The content of procyanidine B1 in the analyzed species of Salix ranged from 0.26 to 2.24 mg/g. The smallest amount of the compound was observed in S. purpurea extract (Pobłocka-Olech and Krauze-Baranowska 2008). The HPTLC method was also used to separate bioactive compounds from S. alba buds, but also to test their antibacterial and biochemical activity (Hage and Morlock 2017). Phenolic acids, flavonoids as well as non-salicylic glucosides were analyzed in methanolic extracts of willow (S. myrsinifolia) leaves and bark with the use of HPLC–DAD method. The content of chlorogenic acids, p-OH-cinnamic acid derivatives and total flavonoid in leaves was 17.0–33.0, 1.5–8.8 and 5.4–12.3 mg/g d.m., respectively (Paunonen et al. 2009). In turn, the bark contained flavonoids on average 6.5 mg/g d.m, including catechins, luteolin-7-glucoside and hyperin with the amount of 2.47–15.37, 0.00–1.65, 0.00–0.42 mg/g d.m., respectively. In addition to flavonoids, other non-salicylic glucosides, such as picein and triandin (and triandrin derivative), were also identified with the amount of 1.61–31.08 mg/g d.m. for picein and 1.92–25.34 mg/g d.m. for triandrin (Heiska et al. 2007). Brereton et al. (2017) used HPLC to analyze the bioactive proanthocyanidins (condensed tannins) in the stem wood of three willow species (S. dasyclados, S. viminalis and S. miyabeana). Tannins in the methanol extract were determined according to their degree of polymerization by HPLC method with a fluorescence detector (FD). The content of condensed tannins in willow biomass ranged from 0.5 to 7 mg/kg. As for the separation and identification of other phenolic compounds in the willow wood, the UPLC–MS system was used. In the methanolic extract of stem wood, such compounds were identified as shikimic acid, hydroxycinnamic acids (including coumaric acid isomers), hydroxybenzoic acids (including salicylic acid), flavonoids (including quercetin, rutin) and lignans (including pinoresinol, medioresinol). In stem wood, there was a large variation in the content of individual phenolic compounds between the studied willow species. For instance, shikimic acid was present in smaller amounts (0.05–0.62 mg/kg). The content of hydroxycinnamic acids and benzoic acid derivatives was 31.3–131.9 and 16.8–42.9 mg/kg, respectively. The flavonoids were found in the stem of willow wood in the largest amounts. However, a large diversity between the place of harvest and the species was observed. The biomass of S. dasyclados contained 11–91 mg/kg of flavonoids, whereas had S. miyabeana 84–380 mg/kg. The largest amount of flavonoids in S. viminalis was over 150 mg/kg. For biorefinery purposes, there is also a potential to produce lignans. In willow stem wood, six compounds from this group were detected (Fig. 5). The lignans content ranged from less than 10 to more than 40 mg/kg (Brereton et al. 2017). The identification and quantification of phenolic compounds in resins of willow (S. alba), poplar (Populus nigra and P. alba) and several other tree species was performed by Dimkić et al. (2016). On the basis of UPLC–MS/MS analyses, 21 phenolic acids and their derivatives, 30 flavonoids as well as 7 esters of phenolic acids and glycerol were detected in the resins. Among phenolic acids, the caffeic acid (0.68 mg/L) was identified at the highest level, whereas among flavonoids, catechin (6.43 mg/L) and naringenin (0.73 mg/L) were found. The compounds belonging to the flavan-3-ol group, including gallocatechin, catechin and epicatechin as well as procyanidin B1 and B3 were isolated from the ethanol extracts of the bark of S. purpurea. The separation with ethyl acetate and water provided fractions enriched with low molecular weight compounds of flavan-3-ol and also higher molecular compound, proanthocyanidin. To confirm the compounds’ structures various spectroscopic techniques were used, especially nuclear magnetic resonance spectroscopy (NMR) (Jürgenliemk et al. 2007). The reversed-phase HPLC–DAD analysis of poplar bark extracts was performed to separate and identify qualitatively hydroxycinnamic acids, hydroxybenzoic acids, benzoic acid and p-hydroxybenzaldehydes (Baiocchi et al. 1994). Zhang et al. (2006) isolated, identified and evaluated the biological activity of ten flavonoids from stem bark of Populus davidiana Dode. Sakuranetin, rhamnocitrin, 7-O-methylaromadendrin, naringenin, eriodictyol, aromadendrin, kaempferol, neosakuranin, sakuranin and sakurenetin-5,4′-di-β-d-glucopyranoside were isolated and purified from methanolic bark extract. The NMR, MS and IR spectroscopy were used to identify isolated compounds. To evaluate the anti-inflammatory activity of isolated flavonoids, cyclooxygenase (COX-l, COX-2) and xanthine oxidase (XO) assays were used. Kaempferol has been found to exert the strongest inhibitory effect on COX-2, which may partly explain the traditional use of poplar bark in ethnomedicine. Poplar buds and their secretions (resins) are plant materials very rich in phenolic compounds. For this reason, studies on bioactive compounds of poplars focus on the raw material of buds. The supercritical fluid extraction has been widely used in the separation of phenolic compounds from different plant materials (Kosmala et al. 2017; Michalak et al. 2016; Rój et al. 2017). This is evidenced by a number of applications provided by the researchers so far. Kuś et al. (2018) applied supercritical fluid extraction with carbon dioxide in a supercritical state as well as UPLC–DAD analysis of dried poplar buds of P. nigra L. The extraction was conducted at different pressure (8.3–33.7 MPa) and temperature (35.8–64.1 °C). Based on the chromatographic analysis, it was found that the extraction efficiency of phenolic acids and flavonoids depends on the process parameters. The largest levels of bioactive phenols in scCO2 extracts were 1.52, 47.24, 10.25, 79.56, 1.55 and 2.03 mg/g, respectively, for p-coumaric acid, pinocembrin, galangin, pinostrobin, pinobanksin and chrysin at the temperature of 60 °C and pressure of 30 MPa. The phenolic profiling of the poplar bud resins was performed by HPTLC and UHPLC–MS/MS (Dimkić et al. 2016). The HPTLC method was used for the separation of bioactive phenolic compounds from resins as well as initial identification and evaluation of the antibacterial activity of the separated compounds. In the same studies, Dimkić et al. (2016) used UHPLC–MS/MS method to accurately identify and quantify bioactive phenols. Among the identified flavonoids in ethanol–water extracts from P. nigra resins, chrysin (15.2–28.9 mg/L) and pinocembrin (19.7–23.5 mg/L) occurred at the highest concentration. P. alba contained two to four times and three to five times lower amounts of chrysin and picocembrin compared to P. nigra resins. The poplar resins also contained about 20 phenolic acids. Caffeic acid and p-coumaric acid in P. nigra were identified with the largest quantities of 14.2–14.7 and 9.2–32.9 mg/L, respectively. In turn, in P. alba extracts, the dominating acids were p-coumaric acid and p-hydroxybenzoic acid (14.7 and 6.3 mg/L). It was also found that the poplar resins contained much higher concentrations of flavonoids and phenolic acids than S. alba resins. Hage and Morlock (2017) used HPTLC method for bioprofiling of poplar bud extracts. TLC plate silica gel with separated phenolic compounds was subjected to antimicrobial, estrogen-like activity and esterase assays. The most bioactive zones on TLC plates were analyzed by HPTLC–MS and HPTLC–HRMS (HPTLC—high resolution mass spectrometry). It was found that caffeic acid inhibited the growth of Aliivibrio fischeri, chrysin inhibited butyrylcholinesterase, whereas luteolin and piperine were the representatives of potential acetylcholinesterase inhibitors. The poplar bud extract was also analyzed in terms of phenolic acids by two chromatographic methods, including HPLC and GC–MS. The highest content of phenolic acids according to both methods was obtained for benzoic acid (2.44 wt%), cis-p-coumaric acid and trans-p-coumaric acid (3.11 wt%), ferulic acid (1.11 wt%), caffeic acid (0.40 wt%) and cinnamic acid (0.09 wt%) (Maciejewicz et al. 2002). In other studies on the chemical composition of black poplar buds, GC–MS was applied in the analysis of compounds, such as hydrocarbons (heptacosane, pentacosane, tricosane, nonacosane), bulnesol, guaiol and eugenol. and also caryophyllene, caryophyllene oxide and eudesmol (α-, β-, γ-) in small amounts (Isidorov and Vinogorova 2003). The acids analyzed by Maciejewicz et al. (2002) were also present in the extract. Hexane extracts from black poplar flowers contained C21–C31 hydrocarbons (52.1%), sesquiterpenes (17.9%), C6–C10 aromatic compounds (5.7%) and cinnamic acid derivatives (3.7%). In the ether extract of buds, the highest content derived from cinnamic acid derivatives (27.1%). The presence of aliphatic acids and hydroxyacids (6.7%), flavonoids (8.0%) and phenolic acids (2.8%) were also identified (Isidorov and Vinogorova 2003). Rubiolo et al. (2013) applied two chromatographic methods (HPLC, GC–MS) for the quantitative determination of acids, such as caffeic acid, trans-p-coumaric acid, ferulic acid, benzoic acid, 1,4-methoxycinnamic acid, trans-cinnamic acid, p-methoxycinnamic acid, 1,1-dimethylallyl ester of caffeic acid as well as flavonoids, including chrysin, galangin, pinocembrin, pinostrobin and tectochrysin. The qualitative and quantitative analyses of the black poplar flower extract by HPLC and GC–MS methods were compared. The content of the analyzed compounds ranged from 0.2 to 5.32%. Pinostrobin (3.48% and 5.32%, respectively, according to HPLC and GC–MS method), pinocembrin (2.79% and 3.64%) and chrysin (2.78% and 4.15%) were the compounds with the highest amount (Table 3). Propolis is a mixture that is produced by bees of various kinds of resinous substances and beeswax (Marcucci 1995). In Poland, propolis rich in bioactive substances up to 65%, is extracted from leaf buds of black poplar. The healing properties of propolis are mainly attributed to flavonoids, including chrysin, tectochrysin, pinostrobin, pinocembrin and apigenin, as well as quercetin and kaempferol in small amounts. In addition to these compounds, phenolic and aromatic compounds are present which account for about 77% of all propolis components. The main aromatic acids present in propolis are cinnamic acid, caffeic acid, ferulic acid, benzoic acid, salicylic acid, p-coumaric acid and also esters of cinnamic and caffeic acids. Propolis also contains volatile compounds (geraniol, farnesol, caryopyllene, squalene), fragrances (vanillin), hydrocarbons and water-soluble vitamins (B1, B2, B5, B6, C) as well as fat-soluble vitamins, including vitamin D and β-carotene and tocopherols, which have antioxidant properties (Bankova et al. 2000, 2007; Kujumgiev et al. 1999; Lofty 2006). Rubert-Nason et al. (2013) assessed the usefulness of NIRS in a rapid determination of poplar leaves secondary metabolites (tannins, phenolic glycosides). Populus tremuloides contained tannin and tremulacin in the range 11.3–33.0% and 0.05–4.23%, respectively. Among the plants secondary metabolites, many of them show antioxidant activity. The typical antioxidants include the previously discussed flavonoids, non-flavonoid phenolics, tocopherols, carotenoids, ascorbic acid and other compounds. They are important substances as ingredients of food, herbal raw materials as well as medicines and dietary supplements produced from vegetable raw materials. In general, the antioxidant as well as antibacterial and antifungal properties are assigned to natural antioxidants (Aguirre and Borneo 2013; Dimkić et al. 2016; Hage and Morlock 2017; Marinas et al. 2014). The spectrophotometric and fluorimetric methods of TAC determination are used to assess the biological activity of raw materials and plant products. Several methods are used for this purpose at the same time, because there is no one universal and validated TAC determination test. Their common advantage is that they are simple, cheap, high throughput and quick to execute. They are particularly useful in the screening of vegetable raw materials (Aguirre and Borneo 2013; López-Alarcón and Denicola 2013). The methods that have gained widespread acceptance are Trolox equivalent antioxidant capacity assays (TEAC assay), which are based on assessing the reduction properties of antioxidants contained in the raw material evaluated in comparison to the standard that is Trolox (6-hydroxy-2,5,7,8-tetramethylchroman-2-carboxylic acid). In these methods, Trolox is only a standard of antioxidant activity, while the main reagents causing a change in a colour under the protective effect of antioxidants are most often 2,2′-azino-bis(3-ethylbenzothiazoline-6-sulfonic acid) (ABTS—radical cation decolorization assay), 2,2-diphenyl-1-picrylhydrazyl (DPPH assay), fluorescein and 2,2′-azo-bis(2-amidinopropane) dihydrochloride (ORAC assay—oxygen radical absorbance capacity), FeCl3 and 2,4,6-tris(2-pyridyl)-1,3,5-triazine (TPTZ) or potassium ferricyanide (FRAP assay—ferric reducing ability of plasma, also ferric ion reducing antioxidant power). The TAC result is given in mmol, µmol or mg Trolox equivalent (TE) per unit mass of the plant material or volume of the extract, e.g., mg TE/g d.m. Another way to express antioxidative activity is to determine the concentration of extract required to quench 50% of free radical activity (inhibition concentration IC50), given in units of µg/mL lub mg mL. It should be emphasized that the lower the IC50 value, the stronger the antioxidant activity (Aguirre and Borneo 2013; Re et al. 1999; Sarikurkcu et al. 2015; Tálos-Nebehaj et al. 2017; Zhong and Shahidi 2015). The standards of antioxidant activity may also be, e.g., ascorbic acid and Fe(II) salts, for instance, FeSO4 (Kuś et al. 2018; Sergent et al. 2014; Tálos-Nebehaj et al. 2017). The ABTS and DPPH methods are also included in the radical scavenging activity assay. Marinas et al. (2014) used ABTS assay (TEAC assay) for the TAC determination of ethanol extracts from black locust (Table 4). The TAC values were 172.9, 625.2 and 902.2 mmol TE/mL extract, respectively for sheath, seed and leaf extracts. The same method for the TAC determination of methanol–water extracts from the black locust and poplar leaves was used by Tálos-Nebehaj et al. (2017) as well as of water extracts from willow bark by Durak et al. (2015) and Durak and Gawlik-Dziki (2014). The results of ABTS test of poplar buds and willow bark were also expressed as the IC50 value (Zaiter et al. 2016; Zhang et al. 2015b). Todaro et al. (2017) determined TAC in terms of radical scavenging ability using the stable DPPH. The reduction of the radical by antioxidants was followed by a decrease in the absorbance. The DPPH solution was also added to poplar wood extracts. The incubation was carried out in the dark for 30 min and the absorbance at 515 nm was measured with Trolox as a reference. The TAC values largely depended on the extraction method and ranged from about 250 to 675 mg TE/g dried extract (d.e.). Amel Zabihi et al. (2018) extracted willow (S. alba L.) leaves, first-year twigs and stems with the use of 70% ethanol at the temperature of 4 °C for 72 h. The extract was lyophilized and dry residue was dissolved in methanol. After 30 min incubation of the analyzed sample with 0.004% DPPH solution in methanol, the absorbance was measured at 517 nm. The scavenging activity of willow extracts was 19.1 µg/mL (IC50). The positive standards (ascorbic acid and butylated hydroxytoluene) applied under the same conditions showed scavenging activity equal to 12.4 and 13.5 µg/mL, respectively. In other studies using DPPH assay, the results were also provided in IC50 values. TACs of willow and poplar leaves (Tálos-Nebehaj et al. 2017), willow leaves, bark and catkins (Enayat and Banerjee 2009; Zaiter et al. 2016), as well as poplar buds and poplar-type propolis (Zhang et al. 2015b) were evaluated. The wavelength at which the absorbance was measured was generally 515 or 517 nm. Only Enayat and Banerjee (2009) used 490 nm. The color intensity is proportional to the antioxidant concentration of the sample (Kuś et al. 2018; Sergent et al. 2014; Tálos-Nebehaj et al. 2017; Todaro et al. 2017). Black locust extracts showed a large antioxidant capacity of 6.5–8.1 mmol Fe2+/kg extract (363–452 mg Fe2+/kg extract). The same method was used by Kuś et al. (2018) to evaluate scCO2 extracts from poplar buds. TAC of these extracts was 0.30–0.48 µmol Fe2+/mg extract, corresponding to 300–480 mmol Fe2+/kg extract and was about 50 times higher than the black locust evaluated by Sergent et al. (2014). It should be emphasized, however, that black locust wood yield is higher than poplar buds yield. The wood and whole plants are of a great importance as economic raw materials for biorefineries. In other studies, Trolox as the FRAP standard (Todaro et al. 2017) and ascorbic acid (Tálos-Nebehaj et al. 2017) were used as well as TAC was expressed in the effective concentration values (EC50) as in the case of DPPH (IC50) (Durak and Gawlik-Dziki 2014). Todaro et al. (2017) assessed different temperatures of thermo-vacuum treatment (180, 200, 220 °C) and also extraction techniques of poplar wood (maceration, ultrasound-assisted extraction—UAE, and accelerated-solvent extraction—ASE). It turned out that the extracts obtained by UAE (220 °C) showed the highest TAC, even of 752.3 mg TE/g d.e. The wood not treated with thermo-vacuum showed approximately eight times lower TAC value. It is confirmed that fast-growing shrub wood may be a good raw material for ligonocellulose biorefineries (Devappa et al. 2015; Krzyżaniak et al. 2014). A variation of FRAP assay is reducing power assay (FRAP-RP assay), based on the ability of plant polyphenols to reduce Fe(III) to Fe(II), which was used to determine TAC of ethanolic extracts of poplar buds and poplar-type propolis (Zhang et al. 2015b) as well as water extracts of willow bark (Durak and Gawlik-Dziki 2014). Poplar buds extracts had an oxidant activity of 1.55, whereas poplar-type propolis had 2.08 mmol TE/g. IC50 value for willow bark was 0.3 mg/mL (Fig. 6). In addition to ABTS, DPPH and FRAP, ORAC assay is a very useful method. This method was used to assess the antioxidant activity of black locust wood (Sergent et al. 2014) and poplar buds (Zhang et al. 2015b). In both studies, Trolox was used as a standard. Poplar buds are exceptionally valuable and bioactive plant materials (Kuś et al. 2018). Buds TAC was measured with the use of ORAC and was 6.4 mmol TE/g d.m. (Zhang et al. 2015b). Black locust wood extracts showed also high TAC values of 8.4–9.9 mmol TE/g extract. In the case of black locust wood, TAC values were given for 1 g of extract and for poplar buds for 1 g of plant material. Consequently, these values are not directly compared. Nevertheless, it is concluded that the antioxidant activity of wood is significant. For assessment of TAC extracts of fast-growing trees and shrubs, other methods such as β-carotene bleaching assay (BCB), inhibition of linoleic acid peroxidation assay (ILAP) and superoxide anion radical scavenging activity (SRSA) are used less frequently. BCB assay was used to assess poplar wood activity (Todaro et al. 2017), ILAP assay for willow bark (Durak and Gawlik-Dziki 2014), and SRSA to poplar buds and poplar-type propolis (Zhang et al. 2015b). TPC is another important parameter of TAC, which is determined by spectrophotometric method with Folin–Ciocalteu reagent. As for the standard absorbance, gallic acid (GA) is often used and catechin (C) and quercetin (Q) are used less often (Table 5). The results are expressed in the equivalents of these standards (GAE, CE, QE). The Folin–Ciocalteu method was used for the determination of TPC in black locust leaves, seeds, sheaths and woods extracts (Marinas et al. 2014; Sergent et al. 2014; Tálos-Nebehaj et al. 2017), poplar buds, leaves and wood extracts (Kuś et al. 2018; Tálos-Nebehaj et al. 2017; Todaro et al. 2017; Zhang et al. 2015b), as well as willow leaves, bark, catkins, first-year twigs and stems extracts (Amel Zabihi et al. 2018; Durak and Gawlik-Dziki 2014; Enayat and Banerjee 2009; Wiesneth et al. 2018; Zaiter et al. 2016). TPC in black locust wood was 32.0–40.0 mg GAE/g wood (corresponding to 597–603 mg GAE/g extract) (Sergent et al. 2014), in poplar wood (P. nigra L.) 96.7–334.9 mg GAE/g d.e. (Todaro et al. 2017), and in willow stem 153.8 mg GAE/g d.e. (Amel Zabihi et al. 2018). In addition to TPC, spectrophotometric methods are also used in the determination of total contents of individual groups of phenolic compounds, such as tannins (TTC), total flavonoid (TFC), flavan-3-ol (TF3L), flavanone and dihydroflavonol (FDC) in trees and shrubs (Table 5). The total content of condensed tannins is determined by acid butanol assay (Porter et al. 1985). The method was used to determine condensed tannins, soluble and insoluble in methanol in S. myrsinifolia Salisb. leaves and bark (Heiska et al. 2007; Paunonen et al. 2009). The content of soluble condensed tannins in leaves was from 9 to 32, whereas in bark from 97 to 220 mg/g d.m. (approximately 149 mg/g d.m.). The content of tannins in extracts may also be determined by tannins’ reaction with proteins, resulting in the formation of insoluble complexes. Todaro et al. (2017) determined the content of tannins in ethanol–water extracts of poplar wood with the bovine serum albumin solution in 0.2 M acetic buffer (pH 5.0 with NaCl 170 mM) added to the extract. It was found that tannins in poplar wood occurred in trace amounts. Flavonoids are determined primarily by HPLC in the plant material. The particular compounds are separated and quantified by this method. However, already in 1960 a simple spectrophotometric method for determination of total flavonoid content (TFC) was developed. The method is also known as aluminum chloride colorimetric (ACC) method and is based on Al3+–flavonoid complexation reaction. Two modifications of the method are known. The first method requires addition of AlCl3 in the concentration from 2 to 10% (m/v) to the analyzed sample. In some cases, acetate, acid or methanol are also added. The absorbance is measured at 404–430 nm. In an inert environment, this method can be used to determine the content of flavonols and luteolin. The second modification involves the complexation of Al3+ with flavonoids in the presence of NaNO2 in an alkaline environment and is based on the nitration of any aromatic ring present in flavonoids structures. After the addition of AlCl3, a yellow complex forms, which after the further addition of NaOH turns red. The absorbance is measured at 510 nm. This procedure is specific for catechins, rutin and luteolin (Pękal and Pyrzynska 2014). The first method (with no NaNO2 addition) was used for TFC determination in the extracts of poplar buds (gums), poplar-type propolis, poplar and black locust leaves (Tálos-Nebehaj et al. 2017; Zhang et al. 2015b). The second (Al3+–flavonoid complexation reaction in the presence of NaNO2) was used in determination of TFC in poplar wood, willow leaves, bark and catkins (Todaro et al. 2017; Enayat and Banerjee 2009) (Table 5). TFC of poplar gums and propolis was 297 mg RE (rutin equivalent)/g (Zhang et al. 2015b), whereas in poplar leaves 8.4–15.1 mg QE/g d.m., in black locust leaves 2.6–4.6 mg QE/g d.m. (Tálos-Nebehaj et al. 2017) and poplar wood extracts 8.9–563.4 mg QE/g d.e. (Todaro et al. 2017). Enayat and Banerjee (2009) used different solvents for the extraction of willow leaves and bark. The best results were obtained for water and ethanol. In the case of water extracts, TFC in leaves and bark was 280 and 243 mg CE/g d.m., respectively. The use of ethanol resulted in higher efficiency of the flavonoids extraction from bark, for which TFC was 479 mg CE/g d.m. In turn, flavonoids from leaves were extracted with ethanol with slightly better results than with water as TFC of 165 mg CE/g d.m. was obtained. Tálos-Nebehaj et al. (2017) used p-dimethylaminocinnamaldehyde (DMACA) assay to determine total flavan-3-ol content (TF3L) in poplar and black locust leaves. The reaction with 2,4-dinitrophenylhydrazine (DNP method) was used to determine flavanone and dihydroflavonol (FDC) content in poplar buds and poplar-type propolis (Zhang et al. 2015b). TAC and the total content of bioactive components can be the main parameters for the quality evaluation of bioproducts or raw material of lignocellulosic plants. This approach was used in the previously discussed studies by, among others Sarikurkcu et al. (2015), Tálos-Nebehaj et al. (2017) and Todaro et al. (2017). However, most often these methods are the complement of the determination of the biologically active compounds profile using liquid chromatography methods (including Durak and Gawlik-Dziki 2014; Durak et al. 2015; Marinas et al. 2014; Sergent et al. 2014; Zaiter et al. 2016; Zhang et al. 2015b). 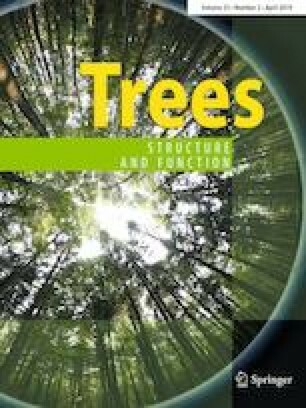 The presented review concerns methods for the extraction and analysis of bioactive compounds in the biomass of fast-growing trees and shrubs that can be grown in the short rotation coppice (SRC). The focus was put on the species used for pharmaceutical purposes and with a high yielding potential, such as black locust, willow and poplar. The presence of many bioactive compounds, among them phenolic compounds (flavonoids, stilbenes, lignans, phenolic acids, tannins and phenolic glucosides), fatty acids, phenolic acids and sterols, carotenoids and terpenes, has been confirmed in the extracts obtained from various parts of plants, including leaves, flowers, seeds, bark, woods, buds, catkins and whole tree material. Solvents of various degrees of polarity were used to extract bioactive compounds from different parts of the plants. The most commonly used polar solvents were water, ethanol, methanol and less often acetone and aqueous NaOH solutions. Nonpolar solvents such as hexane, ethyl acetate and scCO2 were used to extract hydrophobic compounds. Soft plant organs, such as flowers and leaves, are more easily extracted, which is why maceration was generally a sufficient extraction method. Maceration was also used for other parts of plants, in fresh, dried and milled state. Sometimes, to increase the efficiency of the extraction process, the organic solvents were heated to 50–60 °C, and water to 100 °C. However, due to the possibility of decomposition of some bioactive compounds at increased temperature, some authors used chilled methanol. Under these conditions an increase in the extraction efficiency was obtained using ultrasonic-assisted extraction. In addition to maceration and ultrasonic extraction, hydrodistillation, the Soxhlet method and supercritical fluid extraction were also applied. Both spectroscopic and chromatographic methods have been used to determine qualitative and quantitative composition of black locust, willow and poplar extracts. The main chromatographic methods were high-performance liquid chromatography (HPLC) and ultra-performance liquid chromatography (UPLC) equipped with UV detection, diode array detection, fluorescence detection and mass spectrometry. Attention should also be paid to the detection using evaporative light scattering detector (ELSD), which has brought satisfactory effect in determination of phenolic glucosides. Thin-layer chromatography (TLC) as well as gas chromatography equipped with flame ionization detection (GC–FID) and mass spectrometry (GC–MS, GC–MS/MS) were less commonly used. One study described the usefulness of rapid salicin determination using the capillary electrophoresis method, which belongs to the separation techniques as chromatography. UV–VIS spectroscopy was often used due to low costs and simplicity of analysis. However, it has limited applications mainly in the determination of total phenolic content (TPC) and antioxidant capacity (TAC). TPC was mostly determined by Folin–Ciocalteu assay, whereas TAC by ABTS, DPPH and FRAP methods. Different standards were used, including gallic acid (TPC standard) and Trolox (TAC standard) which were often used. In turn, infrared spectroscopy (IR) and nuclear magnetic resonance spectroscopy (NMR) played an important role in identifying each compound isolated from plant materials by multistage extraction, purification and chromatographic separation. The use of NMR was particularly justified in the identification of newly discovered compounds in particular plant species. The near-infrared reflectance spectroscopy (NIRS) was also used to determine salicin in the leaves of willow. This method is useful in the qualitative assessment of a large number of samples of plant material, due to the lack of the need to perform sample extraction and very fast analysis. However, it is less sensitive and more precise than classical methods. However, based on the review, it is concluded that black locust, willow and poplar are the source of important and valuable bioactive compounds that may have a variety of uses. In addition, the use of various analytical and extraction methods in determination of these compounds makes these species, also grown in the SRC system, promising candidates as an alternative source of bioactive compounds, in research for developing new bioproducts for multidirectional use. KT, MK, RK, ER, KW, MK, ŁG, MJS conceived and planned the structure. KT, MK, RK, ER, KW, MK, ŁG, MJS revised the literature. KT, MK and KW contributed to the interpretation of the results. ŁG, RK and MK organized the manuscript. KT and KW took the lead in writing the manuscript. MK, ER, MJS supervised the manuscript. MK, KW took the lead in editing the manuscript. ER and MJS supervised the project. All authors agreed on the final version of the manuscript. This work has been co-financed by the National (Polish) Centre for Research and Development (NCBiR), entitled “Environment, agriculture and forestry”, project: BIOproducts from lignocellulosic biomass derived from MArginal land to fill the Gap In Current national bioeconomy, no. BIOSTRATEG3/344253/2/NCBR/2017.